Part 2 for Higher Intermediate players (Level 3). 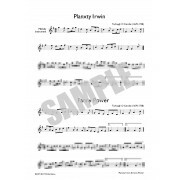 The Planxty Irwin set is a combination of two of Turlough O’Carolan’s most famous tunes: ‘Colonel John Irwin’ and ‘Fanny Power’ arranged for harp ensemble by Janet Harbison. These are the arrangements of the Irish Youth Harp Orchestra (formerly the Belfast Harp Orchestra) which have been played in concert the world over. ‘Carolan was Ireland’s most famous harper-composer – a blind minstrel who travelled from ‘big house’ to‘big house’ entertaining the landed gentry, composing tunes (mostly songs) in their honour, and teaching their children to play the instrument. Carolan was charming and affable, enjoying to drink and be merry with his hosts and over his lifetime, he composed over 200 songs celebrating the quality of his hosts’ hospitality! They were always flattered in his songs and Carolan’s melodies – always memorable - have immortalised them. The Irwin family of Tanrego House, Tireragh, County Sligo was granted land in Ireland under the Cromwellian settlement – where Cromwell paid off his army officers after the various wars in mid 1650s with tracts of newly conquered lands. In Carolan’s time, it was Colonel John Irwin who was the head of the family who had fought with King William at the Battle of the Boyne. In the song that went with this tune, Carolan celebrated Colonel John’s gaiety, bravery and ‘Irishness’ calling him an ‘English Irelander’.